What Are The Best Online Master's in Interior Design Programs? What Else Can I Expect From an Online Master's in Interior Design Program? Individuals who have earned a master's in interior design have ample career opportunities creating dynamic spaces for their clients. This field is growing quickly and also pays relatively well; the Bureau of Labor Statistics (BLS) reports that interior design professionals bring home a median salary of $49,810 per year. Now is an especially exciting time for interior designers, as advancements in technology are providing a large number of tools to develop the interior spaces of the future. The University of Nebraska - Lincoln offers a specialization in interior design as part of the master of science in architecture program. Unlike many online degrees—which are offered as an alternative delivery method for traditionally on-campus material—the master’s in interior design at UNL is designed for and offered solely as a distance learning option. Within the program’s 36 total credit hours, students with specific interests can pursue courses in areas including healthcare settings, workplace environments, education environments, and environmentally conscious design. The program has set start dates each fall and requires a minimum of two years to complete. Extensions are allowed for those who need a flexible, part-time schedule. Applications and portfolio materials must be submitted online by February 1st each year. The program boasts full accreditation from the Council for Interior Design Education. The Savannah College of Art and Design has been repeatedly ranked number one in the nation for interior design study. The online graduate degree in interior design requires the completion of 45 credit hours in courses including emerging interior materials, contemporary issues in interior design, and research methods for interior design. SCAD’s online program emphasizes the relationship we have with our environment through the study of aesthetic theory, culture, materiality, and function. Because SCAD is a private institution, students pay the same tuition rates whether they are enrolled in on-campus classes or eLearning classes. On-campus orientations are not required for online students. Online students are welcome to visit any SCAD campus to sit in on class discussions and meet program faculty. SCAD also engages prospective students through monthly online chat sessions in which they answer program questions and give virtual classroom tours. Ball State University’s main campus is located in Muncie, Indiana, but its online learning programs are available to residents of all 50 states. 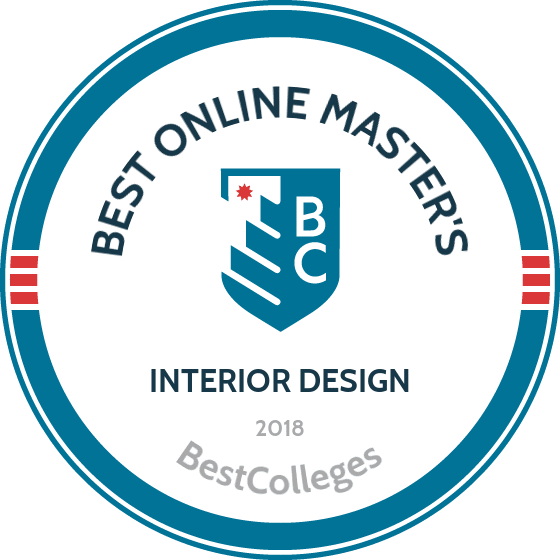 Students who already possess a bachelor’s degree in architecture or interior design can complete BSU’s online interior design master’s degree in two years. This 33-credit program includes courses like environmental psychology, inclusive design, and visual culture in the build environment. The average online class size at BSU is eight students, ensuring that professors can work one-on-one with those enrolled. Prospective students must first apply for admission to BSU’s graduate school, followed by an application for the interior design program. Applicants must submit a resume, portfolio, letter of intent, and recommendations. Although out-of-state residents pay higher tuition costs than Indiana residents, four out of five students receive financial aid. Brenau University’s interior design degree online emphasizes teaching and research rather than introducing or repeating undergraduate concepts. To ensure individual preparedness, prospective students are encouraged to have already earned a professional interior design degree as well as relevant job experience. Students in the extensive 44 credit hour program select one of two concentrations: human environment, which focuses on healthcare design issues; or design environment, which focuses on sustainability and preservation. In addition to graduate research, a unique feature of Brenau University’s interior design program is that all students are required to develop and teach undergraduate level interior design classes. Although all course materials are available online, students are required to come to the Gainesville, Georgia campus during their final year in order to complete their research presentation, thesis defense, and portfolio exhibition. Below you will find helpful information related to what you can expect to experience while earning an online graduate degree in interior design from an accredited college or university. While no two programs are exactly alike, many of the top programs in this field share some common components. Theory and Criticism of Interior Design: This course looks at interior design from multiple perspectives, including the history of the field, current best practices, and how interior design is likely to evolve in the future. Common components include research papers, class discussions, and independent analyses. This class prepares students for future advanced study as they move through their program. Interior Design and Environmental Psychology: Students examine the complex ways human beings interact with their built environments. Social and cultural issues related to gender, health, age, and other factors are also studied. This course gives students well-rounded perspectives on how interior design can impact the health and wellbeing of inhabitants of different types of spaces. Principles of Organizational Ecology: In this course, students learn about the concept of organizational ecology and how it affects the day-to-day work of interior designers. Classes often look at the history of social organizations and how they influence the design and construction of spaces. Professional Practice in Interior Design: This course teaches students about the business side of interior design. Common topics include business ethics, billing and accounting, business formation, purchasing, and conducting post-occupancy evaluations. Students also learn about national exams, state certification, and licensing issues. Building Systems for Interior Design: Focused on the more technical aspects of the field, this course teaches students how to coordinate with design teams and address mechanical, electrical, and structural systems within a building or space. In many cases, students demonstrate their knowledge by creating a construction plan of their own. How Long Does it Take to get an Online Master's in Interior Design? Numerous factors affect the length of time you'll need to invest in your master's in interior design program. These include whether you attend school part-time or full-time as well as the types of internship or practicum experiences you're required to fulfil. The format of each program is another factor. Some schools require students to learn as part of a cohort, where you take classes with the same group of students. Other programs feature independent courses, enabling you to complete your degree more quickly at your convenience. Most master's of interior design degree online programs require students to take about 60 credits of advanced coursework. It typically takes two to three years to complete these programs, although some colleges and universities offer accelerated formats. When exploring potential master's in interior design programs, it's important to make sure that a program or school is regionally or nationally accredited. This signifies the school has undergone a rigorous certification process, ensuring that it offers quality academic programming to its students. Numerous accrediting bodies exist throughout the United States. In general, regional accreditation is more highly regarded. However, schools with national accreditation still meet specific standards and often have more affordable tuition rates. About 85% of colleges and universities nationwide have regional accreditation. While searching for online programs, you should look for regional accreditation from the New England Association of Schools and Colleges, AdvanceED, Middle States Commission on Higher Education, Western Association of Schools and Colleges, and Northwest Commission on Colleges and Universities. The most common national accrediting agency is the Higher Education Council. Additionally, some interior design programs may be accredited by the Council for Interior Design Education. Both the U.S. Department of Education and the Council for Higher Education Accreditation (CHEA) oversee regional and national accrediting agencies. The CHEA is an association of more than 3,000 American colleges and universities and recognizes 60 different accrediting bodies. Additionally, the Department of Education holds accrediting agencies accountable by ensuring they maintain rigorous standards. The Education Department and CHEA both play an important role in making sure institutions of higher learning earn the accreditations they receive. By doing this, they provide assurance to students that academic programs adequately prepare them for careers or more advanced studies. The Education Department and CHEA websites include lists of all accredited colleges and universities in the United States. While a bachelor's degree often allows you to secure an entry-level position in the field of interior design, a master's degree equips you with the skills and knowledge needed for upper management-level roles. Thus, seeking an online graduate degree in interior design can give you access to higher salaries and the potential for greater career growth. A 2015 report from Georgetown University's Center on Education and the Workforce (CEW) and data from Salary.com indicate that graduate degrees offer more opportunities for advancement within interior design and related fields. As they move through their careers, interior designers may have the opportunity to move into management roles and earn more lucrative salaries. In the table below, you'll find data from PayScale showing the median salaries in this field for entry-level, mid-career, and late-career professionals. Individuals who hold master's degrees in interior design tend to be at the higher end of the scale. With an online graduate degree in interior design, you can fulfill a variety of roles in the interior design and architecture field. Successful professionals use technology and incorporate best practices into their work, while also maintaining a sense of creativity as they design spaces for the 21st century. Interior designers tend to be passionate about what they do and spend time looking for new ways to meet the needs and desires of the individuals, businesses, and organizations they serve. The most common position for those with a master's in interior design degree, these professionals create spaces that are attractive, functional, safe, and flexible. They dive into the details of each project, deciding on the best lighting, colors, and materials. An advanced degree typically allows interior designers to move into management roles. Many people with advanced interior design degrees become architects. These professionals design and plan a variety of residential, commercial, and industrial spaces. They also use both technical and creative skills. In most states, architects need to pass an official exam to receive certification. These professionals focus on outdoor spaces, such as parks, common areas, and the exteriors of homes and businesses. Many are self-employed and spend a lot of time working with clients and planning outdoor spaces. They also tend to work outdoors and engage in some manual labor. Due to the similar skillsets, which emphasize a combination of creativity and technical skills, many people with master's degrees in interior design go on to become industrial designers. These professionals create concepts for a range of products, including automobiles, consumer goods, home appliances, and heating and air conditioning systems. They must often combine knowledge from numerous areas—including business, art, and engineering—to develop these products. Individuals with master's degrees in interior design are well-suited for this career, which utilizes their creativity and leadership skills on a daily basis. Tasks may include graphic design, copy editing, photography, web design, and creating interactive videos. When it comes to financing your college education, be sure to investigate as many resources as you can. To start, fill out the Free Application for Federal Student Aid (FAFSA) form to determine if you qualify for financial aid, including grants, work-study benefits, and low-interest loans. You should also search online and check with your school to find additional scholarship opportunities. For example, the American Society of Interior Designers offers a scholarship specifically for interior design graduate students.